This DLC adds new co-op gameplay, new zombies, new loot and more for the game with well over three million players worldwide, and now fans can check out the next chapter in the ultimate zombie survival experience. 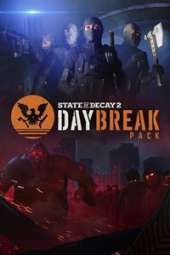 The Daybreak Pack is a brand-new game mode – a re-playable co-op "zombie siege" experience. Team up with friends. Players and up to three teammates play as highly skilled Red Talon soldiers armed with high-end weaponry; together, they will defend a fortified position against waves of oncoming zombies, while a vulnerable technician repairs a critical satellite relay. New enemies and weapons. Among the waves of regular and special zombies players will need to ward off will be a new enemy – the Blood Plague Juggernaut. This is a tougher version of the already powerful juggernaut who will expose players to blood plague. To combat this new scourge, players have access to a new set of CLEO weapons including eight new ranged weapons, six new melee weapons and six new deployable explosives. New rewards and achievements. The more waves you survive, the more rewards you earn. Rewards and unlocked items can be used to fight more efficiently in future Daybreak sessions and players will also be able to access those same unlocked items for their main community of survivors, giving access to the new CLEO weapons, additional accessories and upgrades for their base – including the opportunity to bring in a Red Talon soldier. Lastly, it comes with over two dozen new achievements .